Uncle Bill's Pet Centers. 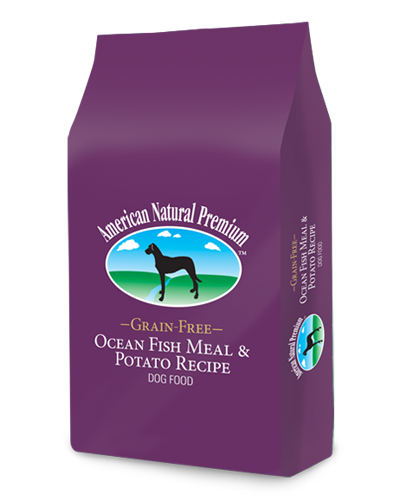 American Natural Premium Grain Free Oceanfish & Potato - 30 lbs. At Uncle Bill’s Pet Center, we not only offer American Natural Premium dog food for sale, we also employ a highly trained staff that can assist you in finding an appropriate formula. Menhaden fish meal and salmon oil support the anti-inflammatory process and maintain healthy skin and a shiny coat. An added blend of antioxidant-rich vegetables including carrots, lettuce and celery support immunity and fight free radicals. Delivers moderate protein and fat levels. We will be glad to work with you to ensure that you feed your dog quality food for optimal health and happiness by providing the best selection and value on premium dog food for sale in Indiana. 4.00 lbs. 12.00 lbs. 30.00 lbs.